In this adventure novel, an Indian boy finds his way of life threatened as the white people encroach on Indian territory in Vermont. White Eagle is destined from birth to be the leader of the Abnaki tribe. As a child, he learns the ways of his people and enjoys the freedom to roam the land. But Commander Flint, a vindictive military man, is convinced that all Indians belong on a reservation, and he vows to move the Abnaki tribe. When the tribe outsmarts him, stealthily moving to a new location, Flint grows mad with his obsession. The tribe is eventually discovered and moved to a reservation by a friendlier military commander. There, White Eagle prepares for his chiefdom, marrying his childhood friend Winonah. The couple have a baby, but when tragedy decimates the village, White Eagle abandons his destiny and returns to the village of his childhood, the place he first called home. There is a lot to like about L.S. Wood’s book, including learning about the existence of the Abnaki Indians. However, the Abnakis are too generically drawn to satisfy readers’ curiosity about this little-known tribe. And while the narrative offers some nice moments—as when White Eagle saves a wounded bird, only to find that its screeching is far from pleasant in close quarters—Wood’s writing is often unwieldy (i.e. : “Commander Flint was a man with an evil sick mind who would destroy the innocent people he would meet if he had the chance to”). Additionally, the text requires a copyeditor to clean up misspellings and other technical errors. 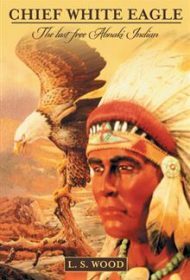 Fortunately, the writing improves and the action picks up once White Eagle leaves the reservation and returns to his original home. The author plans this as the first in a series, which is obvious from the “cliffhanger” ending. If he can deliver the flow of the books last third in subsequent titles, he may entice readers to follow the series to its final destination.